In our personal preparations, our thoughts turn to shelter, specific to the times. An inexpensive underground shelter is worth considering, in terms of safety, obscurity, & protection from the elements. Ideally, one or a few of those Sea Box-type shipping containers would be great, but at $4,000+ each, that's not within our grasp at this time. Wood frames can withstand a great amount of wind, but they also have their limits. It came to mind that underground would be a good place, but not a cave or mine, since the possibility of cave-in is pretty good. For example, a couple started to build a house in the late twenties, but money suddenly dried up during the construction and all they had was the basement. They took the framing for what would have been the first floor, and made it into a roof. They lived in that "underground" house, and even experienced while there, the worst hurricane that part of the country ever experienced. While all their neighbors' homes were literally destroyed by the high winds, my grandparents and family were safe and dry and warm. Most of us are physically able to dig a hole by hand with a shovel, pick and pry bar. The hole has to be about twelve feet wide, bysixteen feet long. Depth is up to you. The deeper, obviously,the better. Save what dirt that comes out of the hole, as it can be used to cover your box. Based upon experience, in packed soil,with six inch rock, a four feet deep hole took me four days of unforgettable hard labor. Many hands make for light work. GET HELP!! The simplest waterproofing would be by using landscape plastic. Six mil would be the best. But if that's not available, the heaviest you can get is better than none. You are going to wrap the entirebox in plastic, then fill in the hole around the box and cover it also. This is why deeper is better. Before you begin putting your frame together, line the hole with the plastic. You will be assembling the frame over the plastic, so be careful not to puncture it. The box, as shown in Figure 1, is made up of five ribs, and two ends. In the extreme southeastern corner of Arizona, where building materials are a little more expensive than the bigger cities,the above materials priced out at $460.00. (This does not include the hardware to fasten this thing together.) A roll of black, 6 mil plastic, 20 feet wide by one hundred feet long is $50.00.If plastic is not available, no reason why a lot of paint and caulk won't work just as good. Worse case scenario, and if nothing is available, don't cover it. As far as fastening this thing together, if you have power available, you can use 3" deck screws to fasten the 2x6's together and 2" deck screws to attach the wafer board to the frame. If there is no power, then a good old hammer and nails will have to do. 10d cement coat box nails if possible, for everything. The problem with hammer and nails is that things tend to vibrate and loosen with such a frame. Have a good heavy brace on the other side of what you're nailing, like an eight pound sledge hammer. 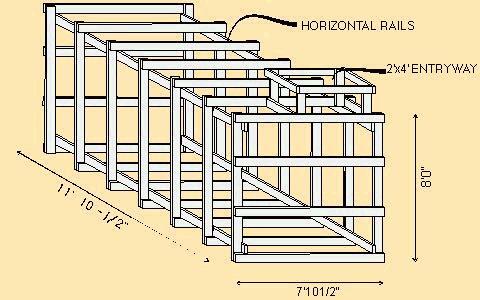 The horizontal members of the ribs and end pieces should be cut to seven feet, ten and one half inches long. All vertical members are to be eight feet. This allows for the overlap of the top panels over the side panels. Construct the ribs and ends, and using the horizontal rails, fasten the frame together. Everything must work in two feet increments,so the panels will match the frame. Be as meticulous as you canin making the frame square. Everything will fit better, if you do. Remember that your panels are four feet wide, and must buttto gether in the center of the rib. Before you do the remaining end and the top, cut your floor panels to six feet, ten inches long, place them inside, and fasten themdown. Finish the remaining end. You can now put the two whole top panels in place, then cut the last panel to fit around the entryway. The last panel you have will be used to cover the access way chimney. I did this to helpkeep debris from falling inside. Make the hatch cover three inches bigger than the outside of the chimney, and frame it with the last 2x6. It will cover the hatch, and fastened down with hook and eyes, will provide some security. When you have reached this point, and have a ladder inside fora ccess, finish wrapping the plastic around everything. Back fillyour dirt around the box and cover it about a foot and a half on top. Pack it down as best you can so it won't blow away. Since the entire box is covered in plastic, it won't breath very well. A lot of bodies generate moisture. With no where to evaporate,this will eventually become a problem in moister climates. The hatch ventilation may or may not be sufficient.